After attending the last Coterie event in Leeds, Beautiful Recruitment won’t be missing The Coterie’s Manchester debut! We’re getting our name on the guest list… as the Coterie have added a new speaker! Brand consultant Yolanda O’Leary has joined hairdressing heavyweights Bruce Masefield, ex-Sassoon creative director, now owner of his own Edinburgh venture and former creative colour force at Toni&Guy Jayson Gray – AKA Karbon Kyd – to complete our expert line-up! 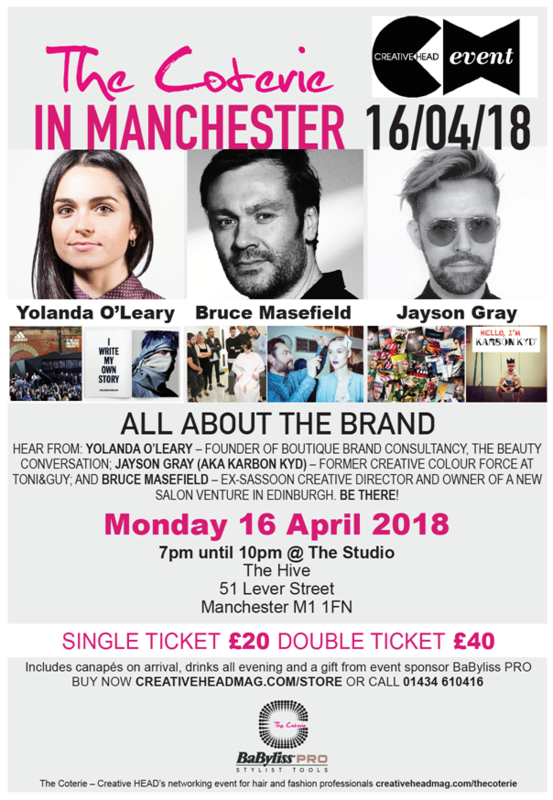 Yolanda has worked with the likes of Lancôme, 3INA, Shiseido, Nike, Converse, Diesel and Gucci and helps brands across the beauty, fashion and luxury sectors achieve commercial success and cultural relevance. Last year, she co-founded The Beauty Conversation a positive collective helping brands to find their unique voice. She knows what it means to create good branding. If you are attending the Coterie Manchester Event too, let us at Beautiful Recruitment know as we’d love to see you there and catch up as well as listen to the triumphant trio shares secrets on how to master the art of self-branding – from finding your niche to crafting an impressive aesthetic. Along with canapés and drinks throughout, it’s the perfect way to meet up and share experiences. We look forward to meeting you on the 16th April 2018! See you soon!